During the summer, the Monmouth County Health Department (MCHD) samples 47 bathing beach sites from Middletown to Manasquan each week. Through a federal, state and local partnership, MCHD works to ensure bathing water quality meets federal and state standards. Results can be found at www.njbeaches.org. In 2016, Health Department staff collected 868 water samples from ocean and bay bathing sites. Our inspectors also conducted more than 208 inspections of public recreational bathing facilities including swimming pools, spas, splash parks, ocean bathing beaches and a local waterpark. Vision screenings are provided by the MCHD and NJ Commission for the Blind and Visually Impaired. A visual acuity test measures your eye’s ability to see letters far away and close up. If appropriate, a prescription for eyeglasses will be written. Screenings are held on the second Monday of every month, from 3-6 p.m. at 3435 Hwy. #9 in Freehold. For an appointment, call 732-431-7456 and press the #1 prompt. As the weather gets warmer the desire to venture outdoors is not unique to those of us cooped up in offices all week long. Our pet companions enjoy the nice weather too, and these excursions allow them to encounter all sorts of new people and interesting new canine and feline friends, as well. This time of year, a great deal of attention is paid to keeping our pets safe from ticks, fleas, and other pests that also welcome the sunshine as much as we do! It’s also a good time to remind our pet owners that in addition to those nasty bug bites, protecting our four-legged friends, and the people they encounter from rabies is critically important. Vaccinations should be kept up-to-date, but in the unfortunate circumstance where a bite either to your pet or that your pet inflicts on another person or animal occurs, there is some important information you should be aware of. A Health Department becomes involved in animal bite incidents because of the potential for rabies transmission. 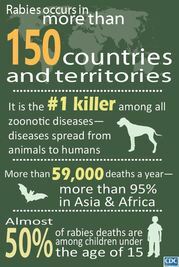 Rabies is a disease affecting all warm-blooded mammals (including humans) and must be treated BEFORE the onset of symptoms in order for treatment to be effective. Our primary objective is to protect the health of the person who was bitten. We are not here to take away your pet OR write a summons. Rabies shots for people are expensive, intrusive and generally unnecessary if the biting animal can be observed for 10 days. Because of this, doctors, hospitals, police departments and animal control officers are required by law to report bites and exposures to the local Health Department. If your dog, cat, horse or other pet is bitten, you may get a visit from the Health Inspector. You will be asked when the last time your pet had a rabies vaccination. Rabies is a neurological disease, affecting the brain. You will be asked about the general health of your animal and if it has exhibited any rabies symptoms. Symptoms include loss of appetite, irritability, inability to swallow, excess salivation, unusual vocalization, abnormal behavior and restlessness, progressing to unprovoked aggression, trouble walking, tremors, seizures or paralysis. We will issue you a “Notice of Bite and Quarantine.” This legal notice advises you that the animal must be observed at the end of 10 days. This ensures the animal has not developed symptoms of rabies or died within 10 days of the biting incident. The notice will instruct you to monitor your animal's health; do not let the animal run loose, it must be supervised by a responsible adult at all times. You may not euthanize or give the animal away during this time period without prior notification and approval from the Health Department. At the end of the period, the animal is observed again for illness. Then a release is signed and the quarantine is lifted. Finally, notification of local Police or Animal Control is extremely important when wildlife or stray animal bites are involved. It is an effective way to protect against rabies disease. To address the significant public health problem of fatal drug overdoses, the County has set-up a Monmouth County Drug Overdose Fatality Review team. Public agencies, healthcare and law enforcement are now coordinating their respective involvement and response to a death from a drug overdose. The Health Department, Human Services Department, and Prosecutor's Office are part of the state and federal team working to coordinate efforts related to overdose deaths. MCHD Health Officer Chris Merkel is the group's Chairperson. The mosquito, accounting for approximately 750,000 human deaths per year, ranks as the deadliest animal on Earth. Malaria, just one disease spread by mosquitoes, is responsible for 600,000 deaths per year. By comparison, sharks kill an average of six people, elephant attacks approximately 500 people, and snakes slither in with about 100,000 deaths per year. Remember to use insect repellent when outdoors, wear long clothing and remove sources of standing water around your home.